Up and coming brands will always try to rally up hype around its launch, and rightly so – how else are they going to get money in the till? Fancy Instagram accounts and social media influencer endorsement are popular methods with varying levels of success. Glossier didn’t need either. Somehow – and honestly I don’t know how with such immediacy – everyone wanted a slice of the Glossier pie. The padded pink pouches your goods are delivered in, the stickers, the ‘Glossier girls’ on Instagram who look just like you and I – we all bought into it immediately. The success Glossier has achieved in such a short amount of time is incomparable. Aside from great products (more of that in a mo), I credit this to on-point marketing. The brains behind Glossier know exactly who their target market is – girls and women (and men too, I’m sure) who want a straightforward skincare routine and makeup products they can rely on, products that do what they say on the tin and do it well. There’s no sense of superiority that can come across with high-end brands either; portrayed via the brand’s Instagram stories, they all seem like twenty and thirty-something women who love their job and aren’t afraid to laugh at themselves. Tutorials and product plugs are also there, of course, but you feel part of the brand rather than simply a customer. They have seriously nailed it. Milky Jelly Cleanser – easily my favourite Glossier offering. Thick and almost sticky in consistency, this cleanser leaves your skin feeling clean and tight without causing dryness. After washing my face in the evening, I would apply the brand’s Super Bounce serum (not pictured because I just finished my fourth bottle) to amp up the moisture and leave my skin feeling plump and hydrated. Generation G sheer matte lipsticks – I have the shades Like (the pink) and Zip (the orange red). I always keep these in my handbag because they’re a fail-safe for perking up my tired face. The shade Like is slightly darker than a typical ‘your lips but better’ tone, while I find Zip much more pigmented and like to dab on and blend with my finger. Two great different shades to keep to hand. Glossier You fragrance – my boyfriend got me this for Christmas, the sweet angel that he is. This is easily one of my favourite scents of all time and I really agree with the description of it smelling different on each person. For me, it is fresh in scent and slightly floral, lingering all day. I like the glass packaging and the indentation for your thumb to aid grip – it’s the little things. I will definitely repurchase! Solution – this is marketed as an exfoliant skin perfector for daily use, but I wouldn’t quite agree on this for all skin types. I would recommend daily use for those with very oily skin and, for everyone else, perhaps twice a week. Applied to a cotton pad and swept across the face, this is great for tackling oily T-zones and stubborn under-the-skin spots. I have combination skin and use it on oilier days or around my hairline when I’ve been exercising a lot and tend to get sweat-induced spots. My friend said she uses this on her bum post-spin classes when she can’t get to a shower straight away – it has helped tackle spots she often found cropping up! If that ain’t evidence of its pore unclogging capabilities, I don’t know what is! 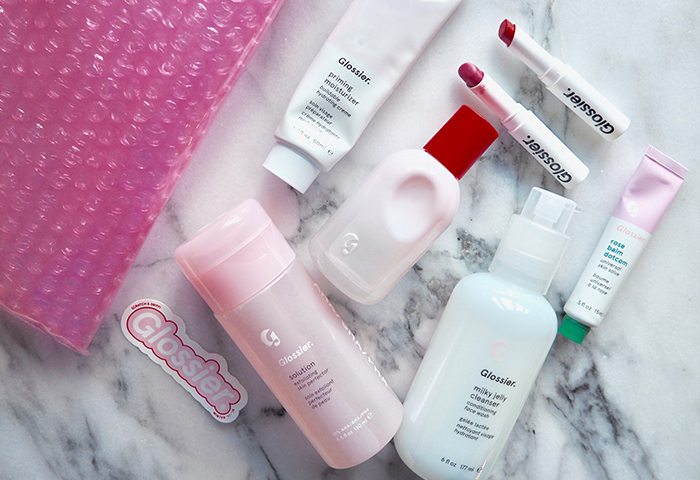 So there we have it – my beginner’s guide to Glossier. Emily Weiss is one badass businesswoman and proof that you can turn an idea and passion into a massive worldwide success with a little research and passion. What a hero. Can I be a Glossier girl?